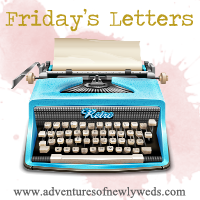 Time for my Friday's Letters! Dear 10 month Wedding Checklist- You are not going anywhere. Let's fix that shall we? Photographer, Videographer ASAP! Dear new job-I am getting the hang of you. I think we might get along just fine. Crazy how a change of scenery changes so many things. Let's see what is to come. Dear Lily- Get ready for all the attention. Maybe it will help your attitude. Maybe not. Then we will just get you a cat tower. We will see. Spoiled princess. Dear beast of a car- Why are your brakes squealing? I just had some pads put on you. I would really appreciate it if you waited a couple of months before I needed to spend a fortune on brakes. Thanks, much appreciated. I will be doing so many DIYs for my wedding thanks to you. At least I hope so, stay tuned. Dear blog- I can't wait until I can get back to my regular posts about my thoughts and life. Hopefully life will slow down after I get used to the new job, new place and many wedding activities. I really miss it all!